Although I can't attend this year's WITNESS concert, "The Duke Ellington Effect," my editor at MinnPost asked me to preview it. Thanks to VocalEssence communications manager (and big U2 fan) Katryn Conlin, I was able to interview Philip Brunelle, the group's founder and artistic director and someone I have admired for a long time. Someone should give him one of those MacArthur Genius awards. Written for the Pi Press in 2000, Matt Peiken's profile of Brunelle is colorful and full of details—a bit old but still worth reading. 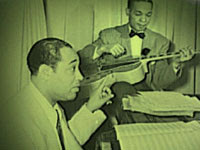 Duke Ellington photo from VocalEssence Web site.